First up, a little housekeeping note, Allen Heck (EpSig 856) has sent in revised contact info, his revised V-card has been mailed out to all, please update your records accordingly. As usual, if any of you know of any Old Bro's who are currently NOT on the roster, send me their contact info and I'll get them hooked up. Likewise, if your own contact info ever changes, drop me a note and I'll update that as well. On April 6, Florida Taylor Ward (a Lambda Chi legend in her own right) celebrated her 93rd birthday. More than just the cook, Flo inspired us, mentored us, co-conspired with us at times, but she always took great care of "her boys" and helped us to become what we are today. Happy B-day, Flo !! In other news, Old Bro George Siegal (EpSig 828) sent in a note about a project he is working on, a documentary film he is creating named "License to Parent" ..... George has established a Kickstarter fundraising campaign to help secure funding for this project, read all about it HERE. Also, many of you Old Bro's responded to Doug Ledsam's request to help out his four month old grandson as he underwent open heart surgery to repair some defects. According to the most recent post HERE, baby Charles is back home resting, recovering, and improving from his recent procedures ..... many thanks to all of you Old Bro's out there who contributed to this effort !! Throwback photos ..... first of all, "Stud of the Week" awards go to both Tom Larson and Jim Hester for correctly identifying the two other Old Bro's in last month's photos as Wayne Sager and Harold Hofer. Both of them also got extra credit for recognizing the girl in the photo as Robin Keller, sister of legendary basement bro Mark Keller. 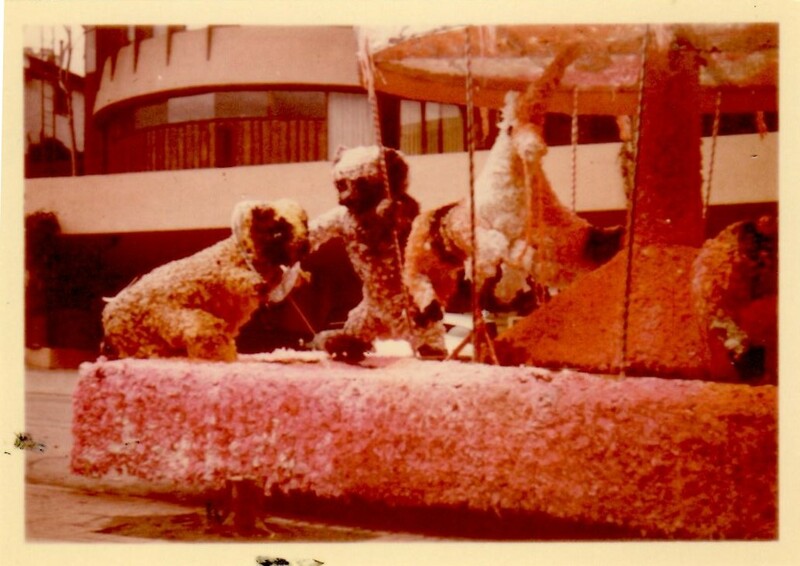 In the fall ’57-’58 We Ep Sigs teamed with Kappa Sigma to build the Homecoming Sweepstakes Parade-winning float; a person-powered moving Carrousel. The float building effort almost Busted me out of school…this afternoon I found a post card grade report ( D in electrical Engineering). Good that I followed Civil Engineering after that. Hope you “techies” can use your computer to enlarge for better view. OK, Old Bro's, you may not have known it (or may not have cared), but the apartment building directly across the street from 10918 Strathmore, seen in the background of the photo above, is designated as a Los Angeles Historic Cultural Monument. First one to name the famous architect who designed this landmark building wins the coveted title of "Stud of the Week". You saw it every time you walked out of the front door of the chapter house, does anyone have any stories to share about it ? ?